Somu was a US Immigrant from India. He was 35yrs. old lived in San Jose with his wife and 5 yr. old daughter. He was the single breadwinner for his family. During a family vacation in Redding CA, he was drowned in the Swimming pool and lost his life at the hospital after struggling for his life for nearly 6 hrs. We are trying to raise funds to fulfill his dreams to raise his lovely 5yr. old daughter. People in US can pay their last respect @ Lima Compagne Sunnyvale Mortuary 1315 Hollenbeck Avenue Sunnyvale, CA 94087 on Thursday (July 6th 2017) between 1-3pm. His mortal remains will be sent to India by next week. Let his soul rest in peace. Please pray to give enough strength to Somu's family during this tough time. All funds collected are transferred to Ramya'S India Account. Thanks all for your support. Soma's mortal remains reached chennai on July 15th and funeral was done on the same day. May his soul rest in peace and God may give his family enough strength. 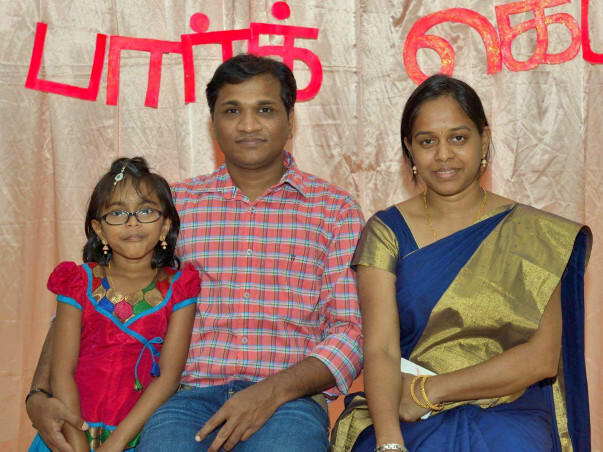 We are planning to close the fund raising and transfer the funds to Ramya. Thanks all for your valuable contribution.